The Roxtec RG M63 is a compact kit sealing solution for cabinets. The three different standardised kit configurations make it possible to seal one to nine pre terminated cables, ranging from ⌀3.5mm to ⌀32.5mm. The Roxtec RG M63 housing is made of nickel plated brass. 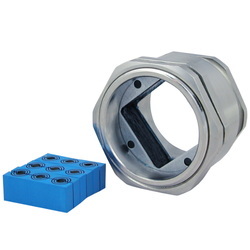 The seal is UL/NEMA 4,4X,12,13 and IP 66/67 rated. The Roxtec RG M63 AISI 316L is made of stainless steel, acid proof material. The seal is rated IP 66/67.